This ride is one of the most scenic in the whole of France. Follow the Canal du Midi from east to west and conclude your ride on the glorious French coast. The canal is perfect for cyclists with flat riding and a number of excellent places to stop, eat and rest along the way. Your journey begins in the famous city of Toulouse but will continue on through a number of beautiful French towns and villages. Spend some time exploring the medieval town of Carcassonne with its numerous watchtowers and double walled defences. 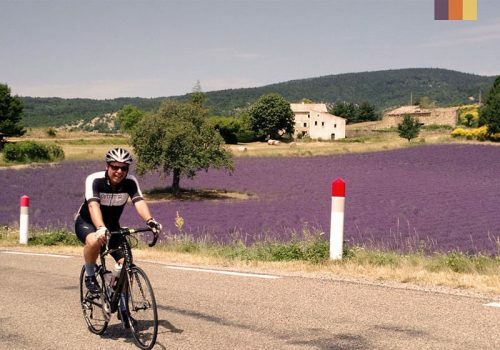 This is the perfect trip for cycling newcomers or those who want to explore a new, stunning region of France. Cycling is the most immersive way to travel through the south of France due to its dedicated cycle paths and its clear signposts. Make your way to Toulouse, the popular cosmopolitan town. The red brick buildings are an iconic feature of the town and make up picturesque historical treasures including the Place du Capitol, St Sernin’s Cathedral and the Couvent des Jacobins. Take the evening to taste the local cuisines and immerse yourself in the town’s cultural buzz before jumping on the bike tomorrow. Head towards the Paul Riquet bridge following the routes that we have provided for you. From here you’ll meet up with the Canal du Midi, the staple point of your holiday. You will instantly notice the barges that are characteristic of this Canal. Ride through the charming region of Lauragais before stopping for your first break in the commune of Avignonet, famous for its history during the Albigensian crusades. Before riding into Castelnaudary, spend some time exploring the Narouze watershed between the Atlantic and the Mediterranean, the highest point in the canal. In Castelnaudary, relax and taste the traditional cassoulet, a delicious local dish. Follow a thousand-year-old towpath to the harbour of Bram. This path dissects the Pyrenees in the south and the Montagne Noir in the east. Your landscape will evolve around you as the vibrant vineyards and stone buildings gradually introduce themselves. Tour through traditional villages and make a stop at the Cugarel mill, the Villepinte dam and te Rebenty aqueduct. You will instantly notice when you reach Carcassonne. The two medieval walls and various watchtowers help to establish a powerful and resolute structure. Explore inside the walls and head to Bastide St. Jean in the lower town. Following a delightful evening in Carcassone, resume your ride on the Canal du Midi. The Orbiel bridge is a site to be admired, as is the overflow canal at Argendoubel. We recommend also stopping at the 12th Century Church in Trebes and the Gallic village just outside Marseillette. The ride today continues through vineyards and countryside lanes, a stunning scenic route and one of our favourites over the 5 days on the bike. Ride past the lock of Argens along the winding hillside path. Relax in the old library if you need a break before cycling along the Canal de la Robine to Capestang. You will get your first site of the sea from the tower here. Ride through the Gallo-Roman remains and the Oppidum d’Ensérune. Finally, observe the work of architect Paul Riquet in the 9 locks of Foncérannes before moving on slightly to the village of Béziers, your final destination of the day. The landscape flattens today as you begin to smell the sea air. Ride through dunes and lagoons before reaching the coastal region and passing the ‘Pont Bache du Lebron’. Reach Agde and the famous ‘dark cathedral’ before crossing the Hérault towards the Thau lagoon. The Canal du Midi, where you have spent the majority of your trip, will come to an end beside the lighthouse in Onglous so say goodbye to this section of the holiday before moving on. Today’s final ride is a scenic stretch along the beach to Sete where you might be lucky enough the see the traditional water joust (‘Les Joutes’) take place. Enjoy a delicious breakfast in the town of Sète, the perfect place to conclude your holiday. As the biggest fishing port in France and with beautiful beaches spanning the coast, you’ll never want your trip to end. Relax in the pastel coloured town and explore the intertwining canals and the Thau Basin. If you have time, eat in one of the harbour-side fish restaurants with fresh fish on offer. We recommend leaving some time free to explore the market before your onward journey. If you wish to extend your trip or move somewhere else, just let our cycling experience team know. Spring is a magical time to visit as vibrant colours appear on the hillsides and the weather begins to warm up after a cold winter. As you move into the later months of Spring, particularly May, the weather is warm without being too hot and the summer crowds have yet to arrive. The summer on the Canal du Midi is usually very hot with little rainfall. It's best to cycle in the mornings before the midday sunshine. The Autumn, similar to the Spring, is a beautiful time to cycle in Provence. The warm summer sun lingers on, there is little rainfall at the start of Autumn and the crowds begin to disperse once again with winter incoming. The Canal du Midi is less popular and often avoided during winter as it's often very cold. Cycling doesn’t get much better than riding alongside the Canal du Midi. The south of France boasts beautiful weather for the majority of the year and an array of colours and landscapes that constantly change with the seasons. The vibrant countryside and expanse of vineyards are ideal for relaxing rides whilst the pastel coloured towns and historical landmarks break up your rides perfectly with incredible food on offer throughout. We have selected the best accommodations for you based on the location, services and atmosphere they provide. We have chosen 2/3* hotels or B&'B's and all rooms have private en-suite facilities. If you wish to upgrade your accommodation, just let our cycling experience team know. We are able to provide you with a number of alternatives for your bike hire. Choose from touring or hybrid bikes or e-bikes. Our Winora Domingo trekking bikes are the most popular option but don't hesitate to ask or enquire about changing this to suit your needs.